Fun fact: I wasn’t going to post a recipe today. The main point of today’s blog was to vote on the Inspiralized Community‘s September Recipe Challenge entrants. I had the post finished on Monday, was excited for everyone to pick the winner and then, I felt odd not sharing a recipe! I’ve gotten into my Sunday – Thursday groove and I wanted to end the blog week on a high note. 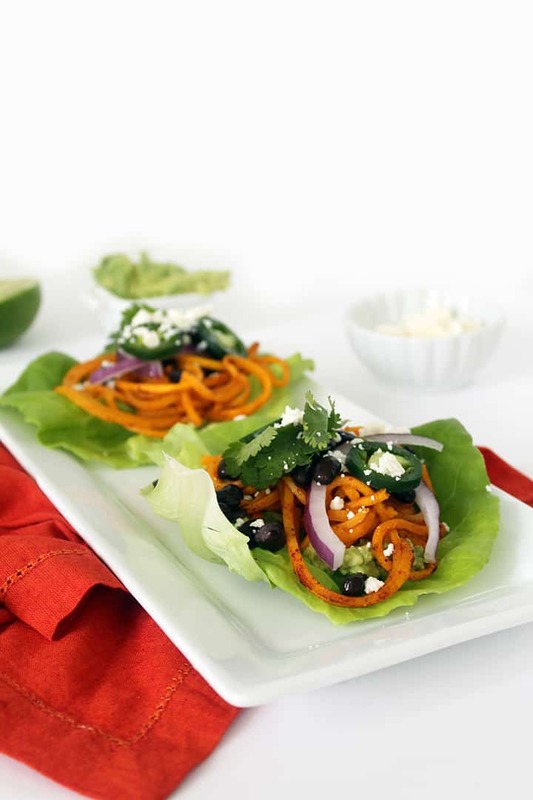 So, today, we need your votes and in return, I present to you: butternut squash noodle tacos. Fall-friendly and waist-friendly! If you haven’t guessed it already, I loove tacos. On the weekends, I’m always debating whether to get tacos and Corona Light or pizza and red wine. Those are two of my favorite “indulgences.” Most often, I choose tacos. 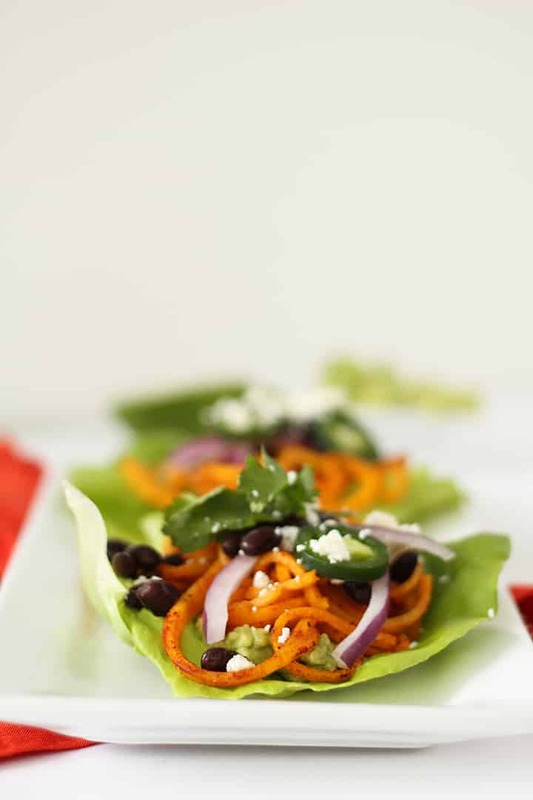 These butternut squash noodle tacos are not only fun to eat, they’re colorful and a convenient way to use seasonal produce (butternut squash is a winter squash and cilantro grows abundant even in cold temperatures!) The feta, black beans, jalapenos and avocado provide the “add-ons,” but the seasoned squash is the star. These noodles are baked in cumin, smoked paprika, and olive oil for the perfect dose of Mexican flavor, while still letting the sweet taste of the squash shine through. 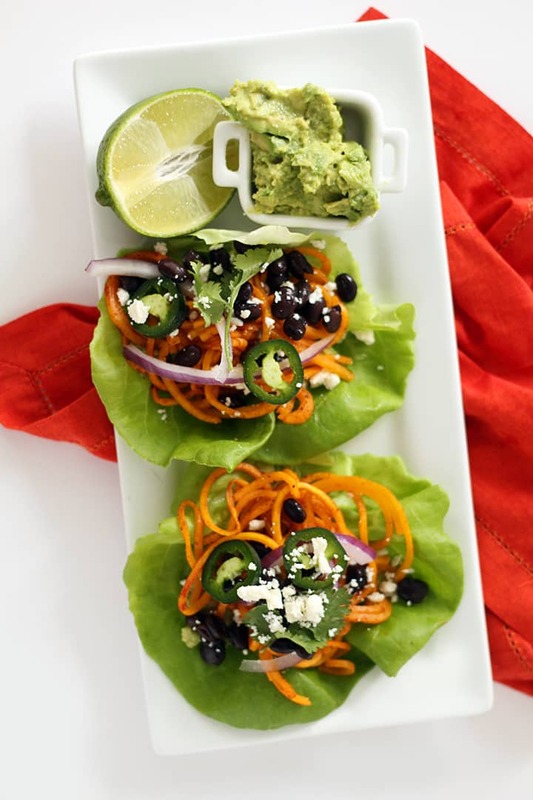 They’re fun to make and definitely crowd-pleasers: what better way to use your spiralizer than for taco night? Don’t forget the Corona Light! Now, for the Inspiralized Community recipe challenges! For those of you who haven’t participated in or heard of these challenges, let me explain. First off, the Inspiralized Community is free to join. 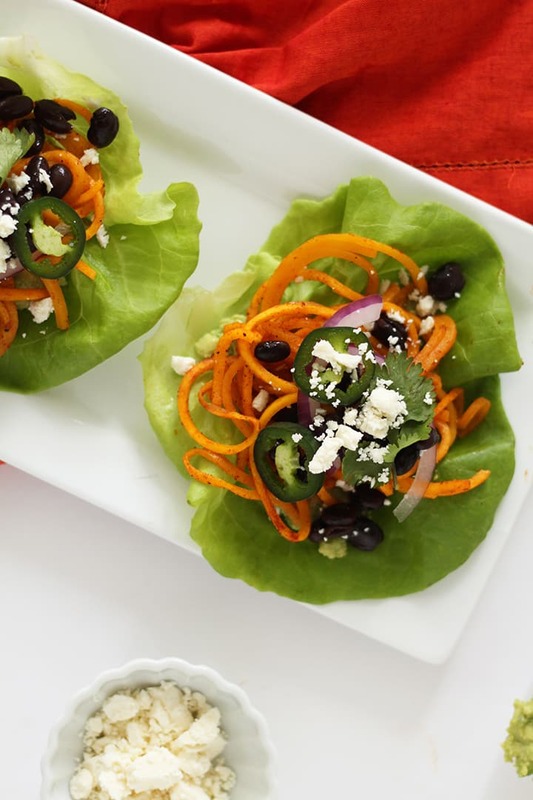 It’s a separate page from this blog that encourages those who love spiralizing and want to get together and talk in one place – offer advice, answer questions, ask me questions and share recipes. There are groups about weight loss, eating gluten-free and spiralized and even monthly recipe challenges. During the summer, I hit the brakes with the recipe challenges, since it’s a busy time of year, but now, they’re back! The fall is coming! 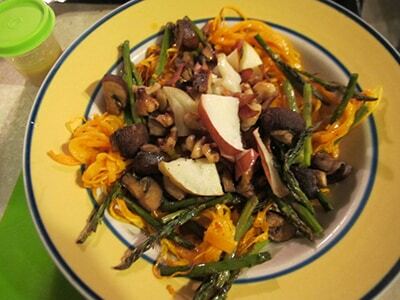 Now that the peak summer months are over, use any fall ingredients to make a transitional fall dish. Think apples, sweet potatoes, turnips and parsnips! Check out the following recipes and vote (at the end) before Sunday, October 19, 11:59pm EST. NOTE: To find any of these recipes, go to the September Recipe Challenge forum. Preheat the oven to 400 degrees. Line a baking tray with parchment paper. Lay out the butternut squash noodles, drizzle with olive oil and season with cumin, smoked paprika, salt and pepper. Bake for 8-10 minutes or until al dente. 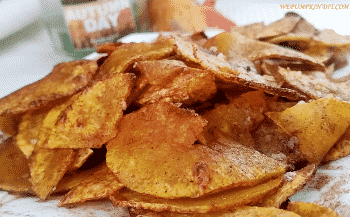 While butternut squash is cooking, slice the jalapeno into thin slices, deseed and set aside. Slice the avocado in half, remove the core and mash the insides in a small bowl with the lime juice and set aside. Thinly slice the onion and set aside. When butternut squash is done, assemble the tacos. 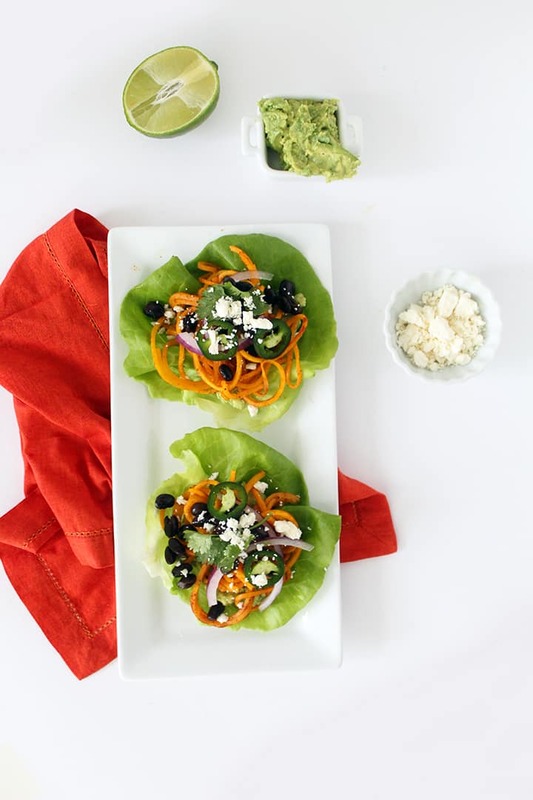 Lay down a bibb lettuce leaf and add in a spoonful of the mashed avocado. 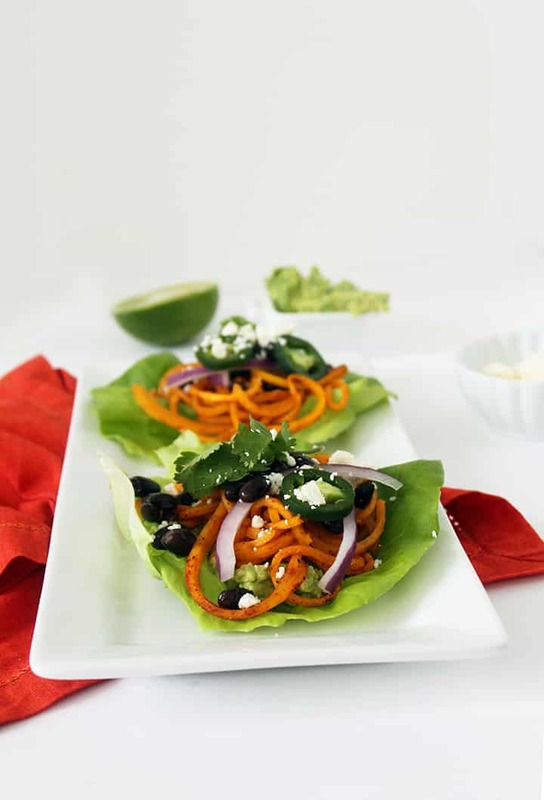 Top with butternut squash noodles and then onion slices, black beans, jalapeno slices, and cilantro. Finish with a crumbling of cheese. these are so creative! and that guac looks heavenly! tacos are a food group for sure. i love the butternut squash noodles. wondering what you do with the non spiralized part of the squas? This was super YUMMY. My daughter is a meat & potato girl (like her dad). I'm slowly converting the two. 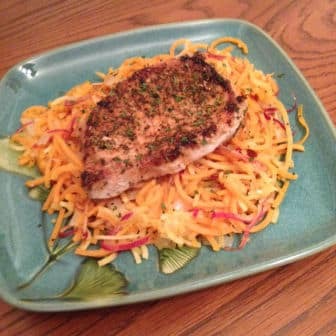 This dish is very flavorful. The spices bring the butternut squash to life; combined with the rest of the ingredients, well what can I say - simply delicious. Thank you!!! Alli is the per serving size/calorie count for one bibb lettuce leaf with toppings or two?